Falna is a small town about 35 km from Ranakpur and will take about 40 minutes to drive down to. Falna is known for its temples apart from its small scale industry. The Jain Golden Temple here well known and is popular with tourists. 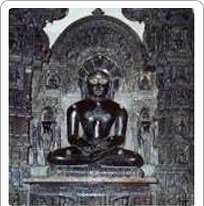 The temple was built with ninety kg of gold donated by the Jain temple community of Falna. The entire temple structure is coated with this gold. The main idol is made of black granite. Another temple, Nimbo Ka Nath situated on the road to Sanderao is also worth a visit. There are also few picnic points around Falna. Among them, Bedala a village nearby is truly beautiful.